On Thursday, February 27, brethren Joe Latchmenarine and Nigel Milo as well as Bonnie and I ate breakfast together in the dining room of our New Amsterdam hotel. Shortly thereafter, Joe took a minibus to Georgetown. A little bit later, Nigel and Bonnie and I took a little stroll around the heart of the downtown. We can’t go anywhere in Guyana except that one or more persons recognize brother Milo; two people today greeted him by name as we ambled along. While browsing (i.e., window shopping), Bonnie bought a couple of plastic hairclips to replace one that broke since we came to Guyana the first of February. Earlier in the morning, Nigel replaced the front license plate—again! We broke two front plates in our four weeks of gallivanting across the nation. Not long after returning to the Little Rock Hotel & Suites, we were joined by brother Michael Hooper. He brought some fish per the request of Nigel’s wife Jasmine. The four of us had lunch together at the hotel. Then, we parted from one another. Bonnie and I with brother Nigel at the helm drove persistently for about two and a half hours to our next seminar location. We worshipped with the Canesville Church of Christ on the outskirts of Georgetown. The building has no electricity and is in a rough part of town—rough because there are no paved roads and no road maintenance, but also rough because of rowdiness after dark. We, the preacher and attendees needed to be out of the area before sunlight faded. There were a total of six persons there besides the six of us. Brother Joe met us there, and sister Jasmine and Zab came in from Linden, too. We commenced with a combined session of men and women with me speaking. Bonnie taught ladies for two sessions while Nigel and I taught the men for two sessions. Joe taught a combined session in conclusion. The preacher, Zab, Nigel, Joe and I sat outside the building on a stoop or on the ground for our sessions. According to design, we six went to a fast food chicken place to have supper together as guests of Bonnie and me. Bonnie, Jasmine and I also availed ourselves of dessert—ice cream cone or Snickers ice cream bars. Having done all of the damage we could do there, we returned to Linden to rest and ready ourselves for the final seminar program tomorrow at the Amelia’s Ward Church of Christ. We will conduct the seminar from 9 a.m. to 3 p.m. and again from 5:30 p.m. to 8 p.m. so that we can accommodate brethren who may be working at their job at one time or the other. One more day of seminars will conclude 15 seminar locations in 28 days. We will leave for the airport at about 1:30 a.m. on Saturday morning. 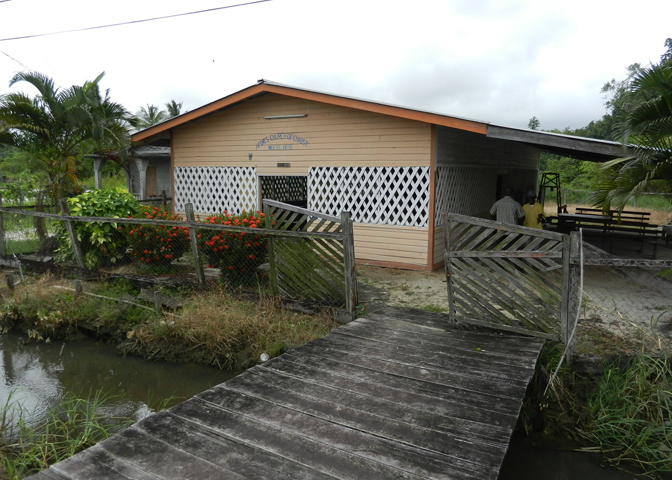 The time went swiftly, and we have mixed feelings about going “home.” We trust that our efforts have met with God’s approval and proved useful for the edification of Christian brethren throughout Guyana. 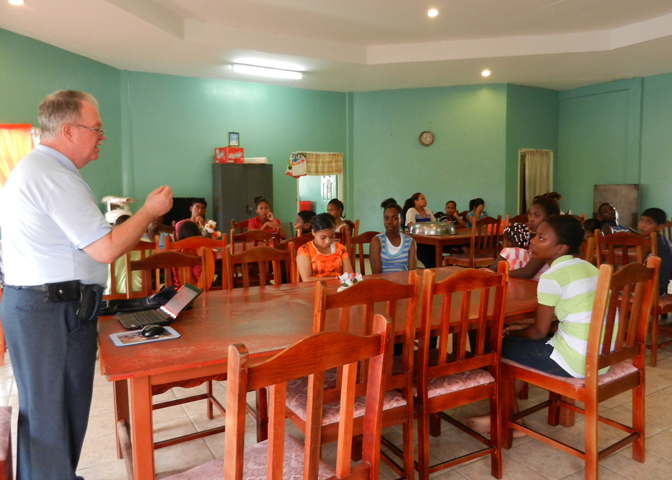 For two evenings (February 25-26), our team conducted a seminar at the Kildonan Church of Christ on the east side of the Berbice River. We lodged Monday through Wednesday in a New Amsterdam hotel. Tuesday morning, we taped television programs in New Amsterdam for the program hosted by Michael Hooper, Evangelist. Brother Nigel also spoke on live radio that day. Tuesday and Wednesday evenings, Nigel, Joe, Bonnie and I spoke numerous times to a goodly crowd of brethren from various congregations in the vicinity. As in every place to which we took the seminar through the country over the past four weeks, our lessons were well received and brothers and sisters in Christ were edified. They already long for our return next year; this was my fourth year in Guyana and the third year of our annual, nationwide, mobile seminars for the edification of the Lord’s church throughout the country. Pictures include snapshots of television taping, produce being loaded onto trucks from boats and fields, presenting copies of Strong’s Concordance to Gospel preachers, make-do spur-of-the-moment scaffolding for repairing light fixtures, and road’s end at the border of Guyana and Suriname at the authorized ferry for crossing the Corentyne River. This trip, we have been to the Guyanese borders of Suriname and Brazil, as well as coming very close to the Venezuelan border. Two more seminars remain before we conclude our month’s long labor here and return to the USA. We are satisfied that we have been useful tools in the hands of God. Our earnest desire is that God may be glorified and that brethren throughout Guyana may be edified. Monday, February 24 amounted to a late start, comparatively speaking, for us. Unlike some of the early morning starts of before 4 a.m. or 5 a.m. to our days on this mission trip, our original ETD was 10:30 a.m. Later, it was re-announced at 11 a.m. 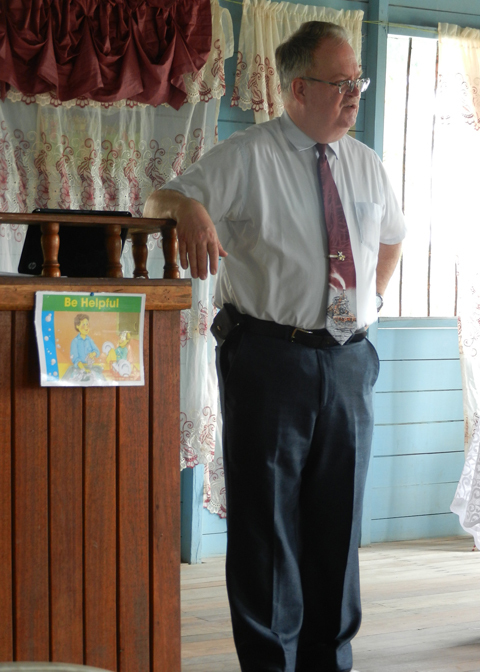 Brother Nigel had scheduled two venues for the day, as the beginning of a four-day excursion in presenting our seminars on this outing. Almost to our first destination of the day, the right front tire takes one for the team and goes flat. Fortuitously, we were able to pull over a few feet ahead at a roadside tire shop. Picture this, a four-lane highway with one of the lanes adjacent to the sidewalk and frame structure occupied by our crippled minibus, with workers jacking it up and changing the wheel. With just a little more time spent than changing tires at a speedway, we completed the eighth of a mile to the meetinghouse for the Plaisance Church of Christ. While brother Joe, Bonnie and I proceeded with the seminar, brother Nigel returned to the tire shop and bought four, new, used tires for the van; he doesn’t buy new tires owing to the expense as well as the terrain and obstacles over which he drives from place to place throughout Guyana. The Plaisance congregation became the host for the night’s program and members for several area churches of Christ. Over 100 brothers and sisters in Christ assembled, leaving standing room only! We had combined classes and split classes of men and women (taught by Bonnie). The panel discussion concluded that venue’s activities, and the interaction was especially lively, particularly about social drinking. The question and answer period did not want to conclude, contributing to us being slightly late for the second appointment of the day at the Lamaha Gardens Church of Christ. This night session was well attended, too, and several congregations were represented. The number was less than what came together earlier in the day, but it was still an admirable display of interest by brothers and sisters in Christ for the Gospel. Following Lamaha Gardens, the four of us drove about two hours away to New Amsterdam. There, we lodged at the Little Rock Suites, where the team of last year lodged, too. We were to lodge at Little Rock for three nights while conducting seminar sessions at the Kildonan Church of Christ and while taping television programs, as we had done last year also. Monday ended for us only because the next day started before Bonnie and I turned in for the night. Before 12:30 a.m., we turned out the light on another good effort by brethren Nigel Milo and “Joe” Latchmenarine, and Bonnie and me to encourage brethren as well as heighten their Bible knowledge at just one more destination among brethren across Guyana in 2014. This annual, nationwide, mobile Guyana series of workshops is winding down. Bonnie and I have been here for over three weeks now, and come Saturday, March 1, we will wing our way back to familiar haunts in the USA. Daily, each team member prays for and devotes himself or herself to glorifying God through our meager and humble efforts. Sunday, February 23, 2014, Bonnie and I worshipped morning and evening with the Amelia’s Ward Church of Christ in Linden, Guyana. 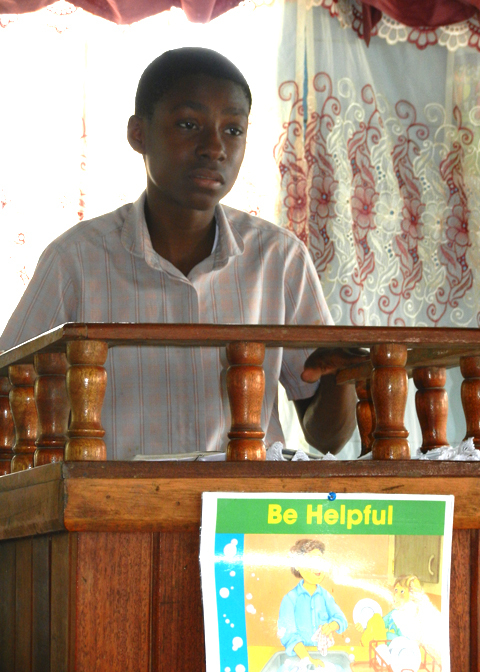 Bible class commenced at 8:30 a.m. and morning worship concluded about 11:30 a.m.—three hours! No one was complaining, escaping quickly or trying to beat the Baptist to the local eatery. Brethren actually seemed desirous of being there, and they sang more praises than typically comprise six worship periods back home in the USA. Brethren lingered still after dismissal. Many remained for meetings respecting future cross country mission trips within Guyana or to make plans for hosting a sister congregation the next week, as well as hosting friends and family, too. That night, the diehard faithful assembled once more for another hour and a half, stayed after to enjoy conversing with each other, and had a short men’s class before parting company. The Amelia’s Ward Church of Christ is one of the most remarkable and active congregations of the Lord’s church of which I am aware anywhere on planet earth. It was my good pleasure to teach the a.m. Bible class and preach the evening sermon. Tomorrow, we head out for another four-day series of seminars before returning to Linden Thursday night. 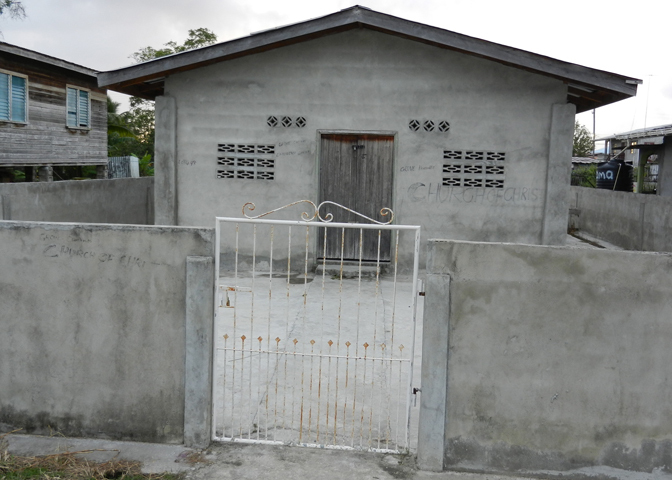 Friday, February 21, 2014 afforded Bonnie and me, in the custody of brother Nigel Milo, to revisit the hostel or boarding school for high school students in Linden. I taught the lesson, “Did Dinosaurs Really Exist?” The number in attendance was diminished by several souls who had departed for the long Guyanese weekend. About 20 students were present, and they were polite and attentive. One 13-year-old girl lamented to Bonnie and me with teary eyes that her father was unable to fetch her home, and so she must stay behind in the dormitory. This young lady recently submitted to baptism into Jesus Christ. She appeared mature beyond her years, also expressing a sense of guilt for coming to school in the first place and not being home to help her parents make a living and help care for her younger siblings. The alarm time of 5:45 a.m. came sooner than we had hoped on Saturday. Hurriedly, we readied ourselves for an ETD of 6:30 a.m. Nigel, Bonnie and I headed toward Georgetown to intercept Joe at the Demerara Harbor Bridge. Crossing the pontoon bridge once more, we turned left at the next junction instead of the typical right turn. Shortly from there, we came upon the meetinghouse for the Nismes Church of Christ (pronounced “neems”). Nearly an hour early, we continued past the building for miles, exploring the villages along the way. When not populated with residences, rice fields lined both sides of the road. We were particularly interested in the sugarcane fields and the sugarcane processing plant. 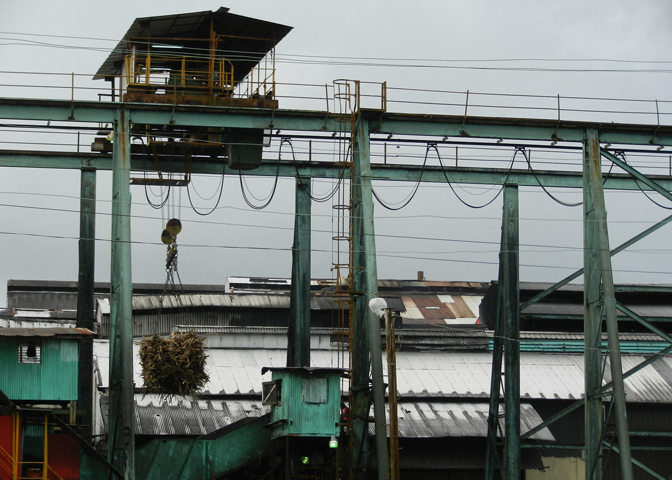 An outdoor, overhead crane lifted wagonloads of sugar cane high into the air before depositing them on to a conveyor that was climbing up into a vat. Wagons, piggy-backed to a tractor, as well as canal barges helped transport the raw sugarcane to the processing plant. Workers harvested the sugarcane by hand. Our seminar program was an hour late beginning since only the preacher had arrived by the announced starting time. Finally, six congregations in total were represented, with a total attendance of about 33 persons. Overall, we expect to increase the Georgetown area attendance over last year by offering four venues instead of just one as we did in 2013; whereas 70 came formerly, this year with added locations we may see 120 attending. Bonnie taught two ladies’ classes, whereas I had opened the day with a presentation to a combined session of sisters and brothers; later, I taught a men’s class. Joe taught a men’s class as well as a combined session, too. We concluded with a panel discussion (questions and answers). The day’s activities were punctuated with lunch on site and a snack before parting. This was a short day for the team, and we were able to arrive back in Linden by about 3 p.m. It was another good day, in which we hope that we glorified God and edified those with whom we came in contact. Monday, February 17, 2014 was a travel day, but it was also a seminar day, too. Brother Nigel Milo, Bonnie and I departed Linden, Guyana in the church van around 4:30 a.m. for the Ogle International Airport—the smaller airport outside Georgetown. That means Bonnie and I got up, dressed and finished packing at 3:45 a.m.! Along the way, we picked up brother Joe Latchmenarine at his parents’ home in Georgetown. We all checked in for our flight for Port Kaituma at Air Services Ltd., and then we drove back the few blocks to the terminal building to clear Immigration—an oddity to me since we were not leaving Guyana. By 7 a.m., two Cessna Grand Caravans were loaded, aloft and headed for Port Kaituma on the northwest area of Region #1. Our route initially took us over the Atlantic Ocean along the coast before crossing overland and depositing us at our destination. Sister Cheryl Etwaro received us into her and brother Kishore’s home and fixed us breakfast. 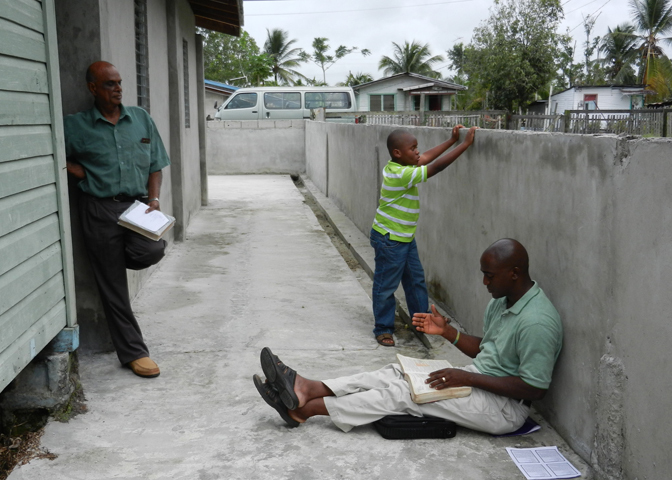 Later that day from 4 p.m. to 6 p.m., we four presented our seminar at the meetinghouse of the Estate church of Christ in Port Kaituma; about 30 brothers and sisters in Christ (including their children) attended. Very tired, we went to bed early. As a sidebar, Kishore is a budding rancher. He has turkeys, ducks, rabbits, turtles and he wants to add sheep and a horse to the mix. I can just see it all now, brother Kishore astride a horse herding turtles, rabbits, turkeys, ducks and sheep. It brings a smile to my face and a fond memory of a dedicated, loving Christian family. 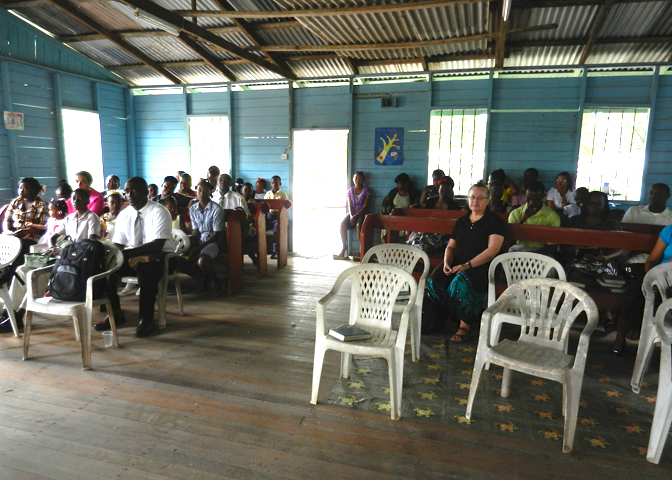 Tuesday morning, we made our way by boat to the Turu Mission church of Christ building for a seminar program from 9 a.m. to 4 p.m. Several congregations were represented with an attendance of about 101. As in all of our seminars, Bonnie taught some ladies’ classes while brother Joe and I spoke for joint sessions of men and women as well as taught men’s classes. An unintended guest (and unwelcome, as far as I was concerned) was a huge, hairy, black tarantula spider on the rafters above where the speakers stood to present their lessons. Port Kaituma has some of the worst mud roads that Bonnie and I have ever encountered in any of the countries to which we go. Commonly, locals say that it is literally faster to walk than go by car. The remnants of the Jonestown encampment happened to be only approximately three miles from where we were lodging with the Etwaro family, so Bonnie and I had a brother take us to the entrance of the site. People are always asking me if I have ever been to Jonestown, Guyana; now we can say that we have been there, and we have a picture of us at the arch on the entrance to prove it. Late that night, an ATV with two people aboard collided with a truck, killing both riders of the smaller vehicle. Wednesday morning, Joe, Nigel, Bonnie and I traveled by boat 90 miles from Port Kaituma to Mabaruma for still another seminar; this is where Joe lives with his wife and two daughters as he works as the minister for one of the area congregations of the Lord’s church. Whereas last year, it took three hours (in the rain) for us to make the trip in an open boat, this year with a faster craft, we cut the travel time in half. At first, the wind seemed so ferocious because of the speed at which we were hasting that we could hardly open our eyes. Later, we were able to open our eyes, though they watered much. Traveling the rivers, we observed boat buses taking children to school, dugout canoes, women washing clothes in the river, mothers washing their young children in the waterways and simple tropical homes up on the banks. For many miles, all we saw was limitless jungle on both sides of the watercourses. One hour up the river, we stopped for gasoline at the junction of another river. After refueling, our boat captain navigated our water taxi up the next river, and half an hour later, we arrived at Mabaruma. First, we checked into our hotel, the Broome Guesthouse. 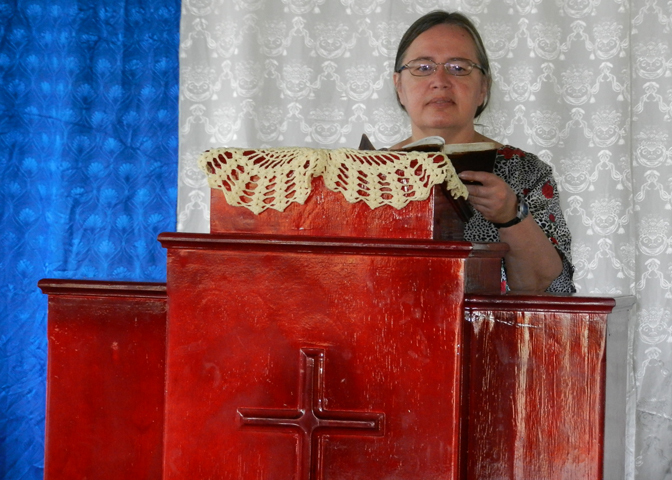 Within the hour, we traveled the short distance to the meetinghouse for the Mabaruma church of Christ, whereupon we presented our seminar program from 9:30 a.m. through 4 p.m. Four congregations were represented with a total of around 30 present. After supper, we returned to the building for an extra program with teenage Christians; they and we totaled about a dozen. Earlier in the day shortly after our arrival at the meetinghouse, Bonnie made the acquaintance of one colorful bird that flies about the Mabaruma neighborhood. It did not want to let go, and it even pinched her with its beak, maybe to see if she were real. By the dark of early morning on Thursday, we attempted what by daylight are routine and ordinary things—get dressed, shave and pack our suitcases. Electricity is only available in the rooms, by way of a generator on the premises of the guesthouse, from 5 p.m. to 3 a.m. Even after 3 a.m., we sleep with the noise of the generator in the background out our window, but management directs the electrical power only to the hallway. Apparently, the water is only available at night, too, since we had absolutely no water in the morning with which to wash, etc. We made our way to the small, local airport. Each of us checked in with the airline representative, the local immigration officer and the local policeman. The one-room terminal was full with people who had come to ride the two flights from different airlines scheduled to fly out at around 8 a.m. Checking includes weighing luggage and passengers! I kidded Bonnie as to from which “gate” we would be boarding our flight. As I predicted, the intangible “gates” from which we boarded our little plane and others boarded the other “airliner” were adjacent bald spots in the gravel adjacent to the asphalt runway. By 9:30 a.m., we had arrived back in the greater Georgetown area. A little later, we four plus a brother from the Dora church of Christ, who also flew from Mabaruma, but on the other puddle-jumper, ate “brunch,” a combination late breakfast and an early lunch, in a Georgetown hotel restaurant. At about 11:30 a.m., we four pointed the church van toward our next venue, the Bath Settlement church of Christ. Along the way, we picked up three other Gospel preachers and the sister-in-law of brother Joe. Even with brother Milo driving slowly (the speed limit), we arrived too early for the afternoon appointment. Fortunately, in front of the meetinghouse was a relatively new, well-kept and commodious Chinese restaurant. Our van load nursed cold drinks and some partook of the food for about an hour while waiting for the appointment time to come. Several congregations were represented at the seminar that night. Our attendance was around 55, with the women as usual outnumbering the men. We had several classes, some combined men and women, some split with Bonnie teaching the sisters in Christ and others with brother Joe and I taking our turns teaching the brothers. Next came the panel discussion (questions and answers), which almost always proves to be a popular facet of the program. Of course, the evening was capped off with refreshments of fruited or cheesy pastries and flavored water. As a side note, while teaching the men’s class was my first time to use a folding chair with a 5-gallon bucket on it for a lectern. It was my own devising from available materials in the room to hold my mini laptop up close enough that I could use for my notes. Decades ago, I stood behind a floor-standing television in an American home to use it for a pulpit for preaching. After dropping several new riders to their homes, we headed back to Georgetown. We retraced our steps, including the re-depositing our passengers who accompanied us to Bath. Tuckered out, we three rode into brother Nigel’s compound around 10:15 p.m.—weary and in need of bathing before retiring for a much coveted night’s rest. Brother Joe stayed in the greater Georgetown area and will meet up with us again Saturday for a seminar, and Monday as we start another 4-day foray of seminars scattered in different Guyanese communities. Friday, Bonnie and I will return to the high school boarding house to present lessons, and Sunday, we will be with the Amelia’s Ward Church of Christ. Mostly, Friday for Bonnie and me is wash day, or otherwise we would have to start looking for our cleanest, dirty clothes! Bonnie and I spent Sunday, February 16, 2014 at our Guyana Home, the domicile of our good friends and Christian brethren Nigel and Jasmine Milo and their son Zab. They live in Amelia’s Ward of Linden, which also serves as our base of operations from which we launch out to all quarters in the nation to edify brethren and reach lost souls. We worshipped in the morning with the Blueberry Hill Church of Christ and in the evening with the Amelia’s Ward Church of Christ. In the morning, I taught “Did Dinosaurs Really Exist?” and “What the Lord’s Supper Means to Me” for Bible class and worship respectively. That night, I once more presented “Did Dinosaurs Really Exist?” and spoke briefly for a men’s Bible class about ‘walking as children of God,’ based on readings from both testaments. During the interim between assemblies, I was able to finish the February issue of Gospel Gazette Online and publish it to the Internet (with some difficulty from South America). After evening worship, I managed to send out nearly 1,500 notices to subscribers that the new edition of GGO is ready. It’s time to pack for our 4:15 a.m. departure for the next legs of our nationwide mobile seminar. We fly from Ogle to Port Kaituma for two days of seminars in two venues. After that, we will take a 3-hours boat ride to Mabaruma for another seminar. From there, we will fly back to Ogle, before traveling by land to yet another seminar. We should arrive back in Linden after we leave early tomorrow morning around midnight on Thursday. It’s beginning to look like we’re going to have to return to the States just to get some rest!